While our website is a good place to begin learning about the Wake Forest School of Business and our programs, it’s no substitute for a personal visit. Whether you’re interested in the Wake Forest Reynolda campus in Winston-Salem or the Wake Forest Charlotte Center in uptown Charlotte, a visit is highly encouraged for prospective or incoming students. During your visit, you can tour the inspiring home for the School of Business in Farrell Hall, take in our beautiful Reynolda campus, explore the culturally and commercially vibrant city of Winston-Salem, meet faculty members and others students, or just get a feel for the Wake Forest culture. Opportunities to visit campus are available year round; please use the following links and resources to help plan your visit. If you’ve been to Charlotte, you have likely passed by the Charlotte Center located in the bustling uptown area. Now home for the Charlotte MBA programs and a variety of activities tied to the local business community, the Center offers a modern and convenient place to learn, network and engage with business leaders. Explore our Charlotte campus and enjoy the splendor of the state’s largest city. Opportunities to visit the Wake Forest Charlotte Center are available year-round; please use the following links and resources to help plan your visit. The following airports offer flights within driving distance to Wake Forest University in Winston-Salem, NC and our Charlotte Center. Please see the airport’s web site for rental car, airport and hotel/motel shuttle services. Click the links below for maps of the Wake Forest University Campus (Farrell Hall is building #60), Parking (Lots W1 and W2 are closest to Farrell Hall), and the Winston-Salem Area. Several hotels, inns and restaurants are listed below for your convenience. We encourage you to make reservations well in advance of your visit. *To receive the special Wake Forest School of Business rate, you must contact the hotel directly instead of using the hotels’ nationwide reservations systems. For other accommodations, visit www.visitwinstonsalem.com and click on Hotel Reservations. For a full list of dining options, visit www.visitwinston-salem.com. Take exit 10-C (5th Street/ Trade Street), turn Left On 5th Street. Follow 5th Street to the 7th traffic light (College Street). Turn left on College Street (we are located on your right). Take exit 10 (Trade Street). At bottom of the ramp, turn right onto Trade Street. Follow Trade Street to the 6th traffic light (College Street). Turn left on College Street (we are located on your right). Take exit 38, follow the signs to I-77 South. Take exit 10-C (5th Street/ Trade Street), turn Left On 5th Street. Follow 5th Street to the 7th traffic light (College Street). Turn left on College Street (we are located on your right). 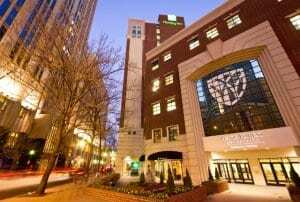 The Wake Forest University Charlotte Center parking garage is located on 200 North College St., Charlotte, NC. You may enter the garage from either the 5th Street or 6th Street side. Please bring your parking ticket with you for validation. Without parking validation, the cost to park in the garage is $2.00 for every twenty minutes (beyond two hours the cost of parking will be $16.00, equivalent to a full day). Head northeast toward E 5th St.; turn left onto E 5th St.; and turn right onto N College St (destination will be on the right). Head southwest toward E 6th St.; turn right onto E 6th St.; and turn left onto N College St (destination will be on the left). Candidates interested in the Wake Forest Charlotte MBA programs typically live in the surrounding area and do not require overnight accommodations. However, if you would like recommendations on local hotels or restaurants, please contact our admissions staff.